We all have projects and tasks that we’ve been meaning to get to for a while. Those items at the bottom of our to-do lists that for one reason or another we’ve procrastinated getting done. Perhaps it’s an organizing project or maybe it’s finally getting to that filing from last year. No matter the task, we’ve outlined some basic steps to help get you started. 1) Review the Project: Although you may have a general idea of what needs to be done, it helps to get a fresh look at the scope of the project. Determine how long it will take, what you need to complete it, and how you will work. 2) Make a Plan: Once you have a basic idea of what needs to be done, it helps to have a specific agenda or outline of how you will work. For example, if the project is to organize your filing cabinets, decide ahead of time, how many years of documents you will keep, what types of docs will be trashed vs. kept vs. shredded, and if you will need input from others during the process. 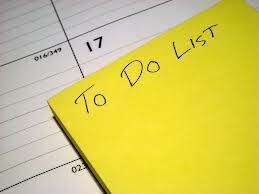 3) Schedule the Time: Putting an allotment of time on the calendar is one of the easiest things you can do to ensure completion of a project. If the task will require several chunks of time, schedule the entire process. Don’t forget to leave yourself enough time before and after to keep distractions from creeping in. 4) Gather What You Need: Before you start the project, gather the necessary tools, supplies, and information. This will keep you from using the excuse of not having what you need to put the project on hold mid-process. 5) Focus on Completion: Once you finally get into the actual work, commit to seeing it through to the end, or the pre-determined stopping point. It’s easy to get distracted or frustrated with things, but if you mentally commit to a goal you’ll find it easier to see it through. We also find that a timer set in brief, but effective time intervals can help. We hope this 5 step process helps to inspire you to get some of those bigger projects started this year. As always, if you need a little extra help, The Well-Organized Woman is happy to assist.